The GL Batch Review Utility is a fantastic tool to locate what has impacted the general ledger, when and where it went. 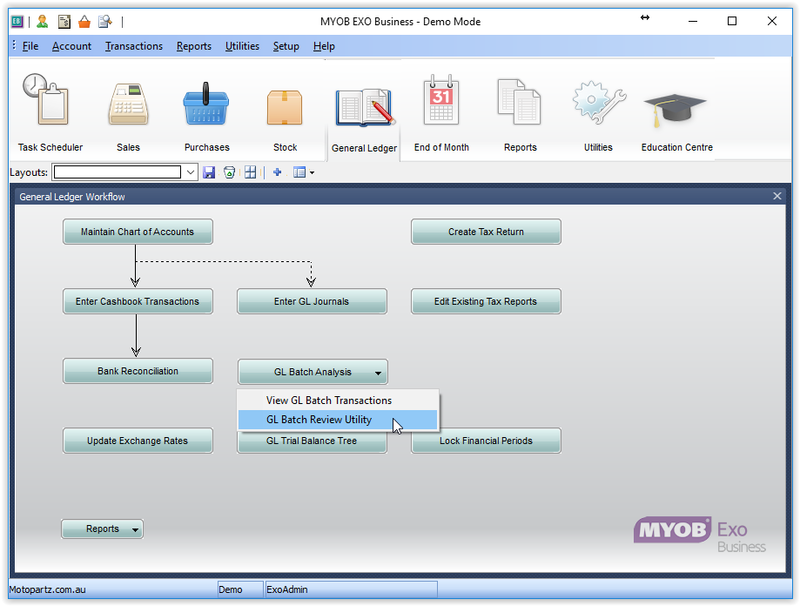 Most often located under the main ‘General Ledger’ screen under the button ‘GL Batch Analysis’. It allows you to search for transactions in the general ledger by date, period, source and amount (amongst other things). For example it can assist when trying to find why a payment to a supplier is not appearing in the bank reconciliation; it may be that the payment was entered with a different date or went to a different bank account. Click the ‘Search’ button and select either Header (just looks at the total values for the batch posted to the general ledger – useful when looking for all general journals or foreign currency entries), Transactions (useful when looking for an individual entry – note this can be a lengthy search depending on what filters have been entered) or both. You can then double click on the batches to see what has gone where and when. Some of this information may require a slightly more advanced understanding of how EXO posts transactions to the general ledger, however it can be very useful for locating transactions. Note only operate the ‘Copy’, ‘Reverse’ or ‘Recalc’ options at the top of the screen or available with a right mouse click on the advice of your Acacia EXO Consultant. Doing so without advice may result in imbalances in your EXO system.